An empty field where the Fort Trumbull neighborhood once stood. It was a fiasco, one that gave Connecticut and one of its oldest cities a black eye. Now we get to relive it. 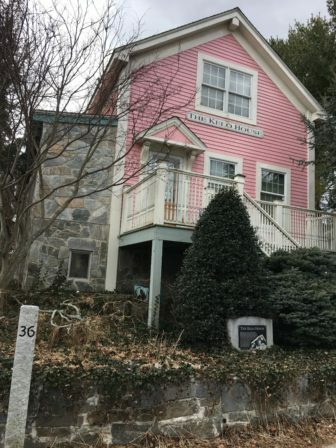 Jeff Benedict’s book “Little Pink House” has been made into a movie that will have an April 15 premiere at the Garde Arts Center in New London, not far from the scene of what many view as a crime. The book and film tell the story of Susette Kelo, a woman who gained national publicity for her years-long battle to save her beloved pink cottage in New London’s Fort Trumbull neighborhood from a major redevelopment project. Kelo’s case went all the way to the U.S. Supreme Court. She lost, but won in the court of public opinion. People across the country were outraged that the city could take someone’s home for economic development, and more than 40 states tightened their laws on eminent domain. And, after years of litigation and a welter of bad national publicity, the proposed development didn’t happen, nor have any subsequent projects come to fruition on the site. The “Little Pink House” that became the focus of the eminent domain fight over the Fort Trumbull redevelopment effort. The house was disassembled and reassembled closer to downtown. 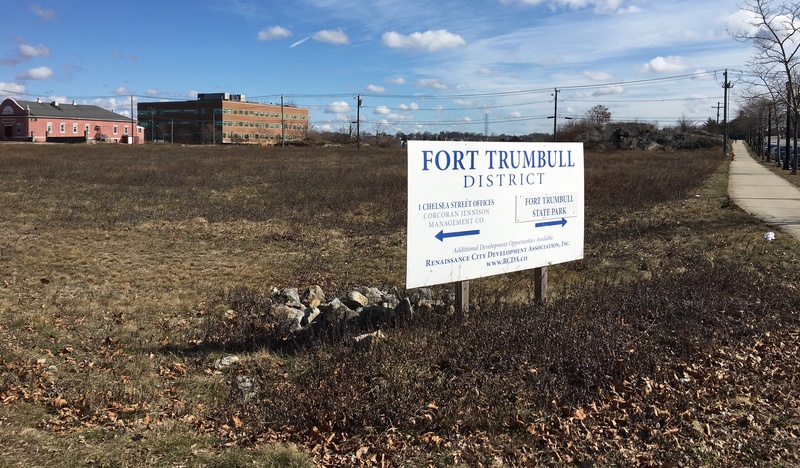 In hindsight, the Fort Trumbull development might have worked, if leaders of the project had taken a different approach, been more transparent and been willing to compromise. Their failure is a cautionary tale for municipal leaders and planners currently redeveloping parts of their cities. New London in some respects is a smaller Hartford or Bridgeport. It is the core of its region and bears much of the region’s social costs, but doesn’t have enough taxable property — it has only 5.54 square miles of land and nearly half of it is off the grand list — to pay its bills. Thus, like Hartford, it has always been vulnerable to the appeal of a big, silver-bullet project that would fatten the grand list. In late 1997 one appeared on the Southeastern Connecticut horizon. Gov. John Rowland, a Republican, decided to make major investments in the state’s cities, including New London. But he didn’t want to deal with the Whaling City’s Democratic power structure. Rowland and his chief of staff, Peter Ellef, brought in local lawyer-lobbyist Jay Levin, a former legislator and skilled political operative. Levin solved Rowland’s problem by reviving the New London Development Corporation, a private, nonprofit entity established in the 1970s to aid the city with development planning. Perhaps reflective of the state of development in the city, the NLDC had been dormant for many years. Levin brought it back to life and, along with others, urged Rowland and Ellef to name Connecticut College president Claire Gaudiani to run the nonprofit. She got the job, and came out of the gate with a spectacular win. Pfizer, Inc., with a major facility across the Thames River in Groton, was looking to expand and build a research center. 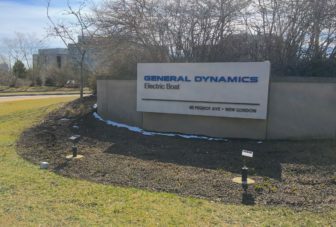 The company hadn’t considered New London, but Gaudiani coaxed company executives to consider the advantages of being right across the river from the Groton site and they bought it. A $300 million research facility on the site of a long-closed linoleum factory was a stunning addition to the struggling city. At the groundbreaking on Sept. 1 1998, Rowland told the crowd: ”Years from now, this will be a case study in how to revive a community.” Rowland proved to be a poor prophet. The Fort Trumbull project may have seemed at the time like a major community revival, but not after what happened next. Pfizer built a huge complex on 24 acres on the south end of a peninsula along the Thames River, on land the city had remediated. At the north end of the site was a just-closed military base, the Navy Undersea Warfare Center, known locally as the “Sound Lab” after the original name of the facility. 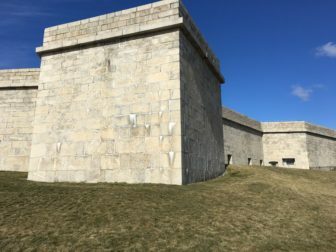 Fort Trumbull, a 19th Century bastion of harbor defense. But, as Gaudiani and the NLDC saw it, not that good. They decided, with the encouragement if not the insistence of Pfizer, to double down on the company’s investment with a grand plan to redevelop the 90 acres adjoining Pfizer with condos, a conference center, offices, a hotel and other facilities. They would do it by wiping out the neighborhood. Most of the 90 or so property owners — of about 115 homes and two dozen small businesses, did sell, but seven owners, who controlled 15 properties, held out. They were subject to unconscionable harassment by real estate people, but hung on. Then they connected with a libertarian law firm, the Institute for Justice, that was interested in property rights. The firm took the case. It went to Superior Court, then the state Supreme Court, then to the U. S. Supreme Court. The Fifth Amendment to the U. S. Constitution allows the taking of land for a “public use.” The question in the Kelo was whether the taking of the land for private development to generate jobs and tax revenue was a “public use.” By a 5-4 decision, the court held in 2005 that it was. The decision followed precedents that allowed takings for economic development. But it was a surprise to many in the general public, who didn’t understand the power of eminent domain and were mad as hell. The property rights movement — they who want government out of land regulation — artfully exploited the case. Network news programs came to New London. The U.S Senate held hearings. More than 40 states tightened their eminent domain laws. Connecticut restricted but did not ban the use of eminent domain to acquire private properties in 2007. Rowland and Ellef might have forced a settlement, but were heading off to the federal hoosegow on corruption charges. Gov. M. Jodi Rell, who succeeded Rowland, inherited the mess and forked over more than $4 million in 2006 to get the last of the holdouts out. By this point, funders were scared off, Pfizer was in merger talks, the Great Recession was coming and the grand plan never happened. The land where the neighborhood stood is still empty. While there are many aspects to a major development, advocates, planners and even a former mayor of New London believe the fundamental mistake, from which all the trouble sprang, was the decision to demolish the residential neighborhood. “There were 90 acres. People lived on 10 acres. It would have been easy to develop around them. That’s all we ever wanted,” said Prof. Fred Paxton, a Connecticut College history professor who was a member of the Coalition to Save Fort Trumbull, one of two groups that tried to save the neighborhood. Indeed, well regarded Waterford architect John Steffian drew up plans that would have redeveloped the area without sacrificing the neighborhood. The Italian Dramatic Club, which escaped demolition. The slash-and-burn model was popular in the urban renewal projects of the 1960s and ‘70s. Most of these projects didn’t renew their cities and left residents — as in Fort Trumbull — longing for their old neighborhoods. Urban renewal almost became an oxymoron; “it was really urban destruction,” said Hartford architect and urbanist Tyler Smith. Large-scale demolition fell out of fashion. By the 1990s, the clear trend was toward smaller projects that incorporated existing buildings whenever possible, said Smith. It keeps historic or useful properties on the tax rolls. It reduces the hefty expenses of acquisition and demolition. It encourages the creation of interesting, mixed-use neighborhoods with active street life, the “ballet of the sidewalk” that urbanist Jane Jacobs championed. It preserves older industrial buildings that can be used for start-ups or small businesses. Had anyone thought to visit local history, New London itself had a neighborhood-clearing urban renewal project in the Winthrop Cove area on the north side of downtown in the 1960s and ‘70s. Scores of historic buildings were torn down, very little was built to replace them, and it was largely judged a failure. Conversely, a later project in the Starr Street area on the southern part of downtown preserved many historic buildings and created an appealing streetscape. Merriam points to the situation of Wilhelmina Dery, one of the holdouts. She had been born in her family’s home in The Fort in 1918, lived there all her life, and simply wished to stay until she went to heaven. Why not let her do so, by giving her a life estate in the property? “Not every building needs to be taken to make every redevelopment work,” Merriam wrote. New London had an earlier and less intrusive plan that would have kept the Fort Trumbull neighborhood intact. But once the NLDC, backed by the state, arrived with the big plan to clear the whole site, the big plan it was. The holdouts were frustrated; as others sold they now occupied two small blocks, less than 2 percent of the 90-acre footprint. 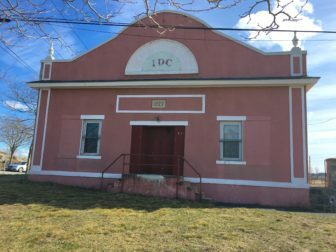 And, an Italian-American men’s club with good political connections, the Italian Dramatic Club, managed to save its building. The General Dynamics facility formerly occupied by Pfizer. Some urged compromise, proposing the NLDC just make a final offer and then develop around whatever buildings were left. Mayor Lloyd Beachy, a retired Navy intelligence officer, suggested putting all the homes of the holdouts on one block. Kelo and some other owners could have kept their houses after winning a partial victory in state Superior Court, which found that the NLDC’s plans were not specific enough to take some of the houses. But they appealed, hoping to save all of them. So, battle lines were drawn, heads and hearts were hardened, no one was willing to give an inch. “Both sides were completely unreasonable,” said current Mayor Michael Passero, who was elected in 2015. And so, four years of litigation followed, leading to a pyrrhic victory for the city, and no development. “The only winner was the Institute for Justice,” said Passero. Asked what New London learned from the debacle, Passero focused on the disconnect between the private NLDC and the city. Many accused the agency of operating in secret. “They held public hearings, but they were a sham,” said Paxton. “We brought hundreds of signatures (from people who wanted to amend the plan) but they were ignored,” he said. He acknowledges that many in the city supported the plan. Also, it was unclear to many who was running the project — the state, the city or the NLDC — and how the state’s money was being spent. After Gaudiani got into a dispute with The Day of New London, the local newspaper, NLDC meetings were closed and requests for documents denied, Benedict reports. The Day filed a complain with the state’s Freedom of Information Commission, and won access to NLDC records. In 2000 Mayor Beachy was hauled away by local police from a demonstration against the project, an indication that the city and the NLDC were not on the same page. Beachy objected to removing the homes, some aspects of the new plan (he didn’t think a hotel would work there, for one thing), and to the way it was pushed through. “They took a bad plan and jammed it down our throats,” he said in a recent telephone interview. The NLDC has been reconstituted as the Renaissance City Development Corp., and Passero says it is working hand-in-glove with the city. The Fort Trumbull site, however, is still empty. A hotel deal recently fell through, as did a plan for 103 condominium units. Other ideas have been floated for the site over the years, including a hydroponic farm, a desalinization plant and a wind farm. Some think New London got nothing out of the $90 million in public funds invested in the site, but that is nowhere near true. Pfizer left its massive complex in 2008, following a corporate merger (and the expiration of its 10-year tax abatement), but — here the city finally caught a break — the Electric Boat Division of General Dynamics took over the site and now has 3,600 employees there, according to the city, about three times the number of workers Pfizer had on the site. Also, early on, the state rehabbed the fort into a lovely waterside state park, and the one building saved from the Sound Lab, a four-story office building, is leased and is paying taxes. It is the central part of the peninsula, where the neighborhood stood, that remains empty. On the plus side, in 2011 city officials arranged for planners from the Yale Urban Design Workshop to develop a plan for the site. The Yale team held community charrettes, or design sessions, and produced a plan for a mixed-use neighborhood with connections to the historic downtown and other parts of the city. If the city is able to follow this template, The Fort can become a neighborhood again. One might argue that this is the process the city should have followed in the first place. For all of the furor, it is hard to find a villain in the piece. As the movie will doubtless show, Susette Kelo is a sympathetic figure, a divorced woman from a hardscrabble background who studied to become an EMT and a nurse, and bought the house of her dreams, a little cottage with a view of the water. The stories of the Derys and other holdouts also tug at the heartstrings. 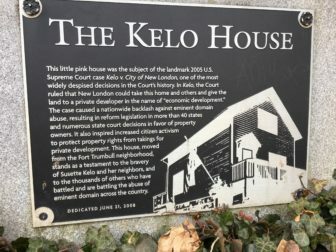 A plaque in front of the Kelo House noting the eminent domain battle. At the same time, Gaudiani and the other NLDC volunteers were trying to do their best for the city. Though her flamboyance turned some people off, Gaudiani was attempting what a lot of college presidents, of institutions such as Yale, Trinity, RPI, Penn and others, were doing then, trying to improve their surrounding communities. She may have tried too hard; a faculty backlash against her investment of college funds in downtown New London properties apparently was a factor in her departure from the college in 2001, after 13 years as president. She has long since moved to New York to teach philanthropy at New York University, and appears to have put the Fort Trumbull controversy behind her. “New London is almost 20 years ago for me,” she said in a brief email exchange. Also, it was not unreasonable that Pfizer would want the area around its new facility improved. Between the new Pfizer complex and the Fort neighborhood were a sewage treatment plant that needed to be cleaned up and capped, and a scrap metal yard that needed to be removed, and they were. Part of the problem is that eminent domain can be a blunt instrument. Merriam argues that government should make eminent domain “kinder and gentler,” perhaps by offering funds for legal assistance for those whose property are targeted for taking — rarely are they wealthy — or by bringing back a property rights ombudsman, something the state had, but dropped for budgetary reasons. A few states have such an office. Merriam also urges government to find alternatives to eminent domain, such as allowing property owners to become shareholders in a proposed development. Tyler Smith argues that no building should be torn down unless there is an approved plan and financing for its replacement in place, and a binding commitment from the developer to follow through on that plan. Demolition, he said, should be a last resort. Such a policy might have saved The Fort, where demolition was the first resort. Also, though there was a “preferred developer,” it was unable to line up financing. So what is left are still-bitter former residents and an anomaly: shovel-ready shoreline property in Southern New England that no one seems able to develop. For the next several months a remarkable partnership of media organizations will take a close look at Connecticut cities. We call it The Cities Project. A Delaware judge is weighing competing claims by the insurers whose failed merger turned into a messy divorce. The information technology firm already has pledged to create 1,000 new jobs in the Hartford area. The quest to develop the supercomputers of the future is now taking place in part at a lab in New Haven. Connecticut’s economy and the nation’s are poised for strong growth in 2019, though both are at risk of recession by 2020, economic experts warned hundreds of business leaders Friday.